Definition at line 41 of file llfloatereditui.h. Definition at line 108 of file llfloatereditui.cpp. References LLView::addChild(), LLPanel::childSetAction(), f, LLRectBase< Type >::getHeight(), LLView::getRect(), HPAD, LINE, mHeightSpin, mLabelLine, mWidthSpin, navigateHierarchyButtonPressed(), NULL, onCommitHeight(), onCommitLabel(), onCommitWidth(), S32, LLView::sEditingUI, LLSpinCtrl::setPrecision(), sInstance, LLFontGL::sSansSerifSmall, TRUE, VPAD, x, and y. Definition at line 214 of file llfloatereditui.cpp. 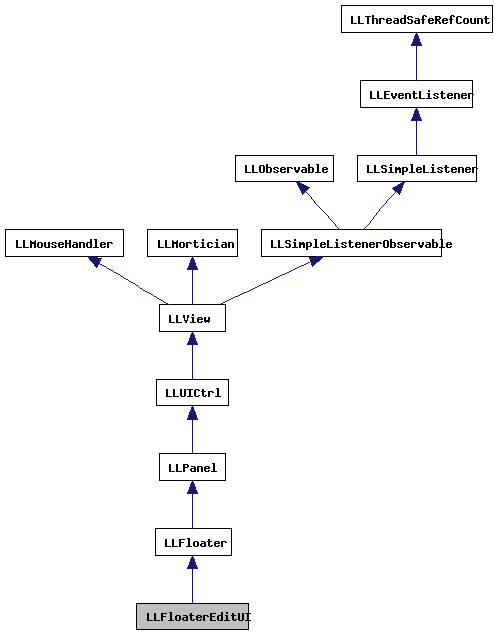 References FALSE, NULL, LLView::sEditingUI, LLView::sEditingUIView, and sInstance. Definition at line 222 of file llfloatereditui.cpp. Definition at line 330 of file llfloatereditui.cpp. References FALSE, LLView::getRect(), KEY_DOWN, KEY_LEFT, KEY_RIGHT, KEY_UP, MASK_NONE, MASK_SHIFT, r, refreshCore(), LLView::reshape(), S32, LLView::sEditingUIView, LLView::setRect(), sInstance, and TRUE. Definition at line 46 of file llfloatereditui.cpp. References LLView::getChildList(), LLView::getParent(), NULL, refresh(), LLView::sEditingUIView, and sInstance. Definition at line 412 of file llfloatereditui.cpp. References LLSpinCtrl::get(), LLView::getRect(), height, r, LLView::reshape(), S32, LLView::sEditingUIView, and LLView::setRect(). Definition at line 396 of file llfloatereditui.cpp. References LLLineEditor::getText(), LLView::getWidgetType(), LLView::sEditingUIView, and WIDGET_TYPE_BUTTON. Definition at line 426 of file llfloatereditui.cpp. References LLSpinCtrl::get(), LLView::getRect(), r, LLView::reshape(), S32, LLView::sEditingUIView, LLView::setRect(), and width. Definition at line 228 of file llfloatereditui.cpp. References f, FALSE, LLView::getParent(), mHeightSpin, mLabelLine, mLastView, mWidthSpin, LLStringBase< char >::null, NULL, refreshCore(), LLView::sEditingUIView, LLSpinCtrl::set(), LLSpinCtrl::setEnabled(), LLLineEditor::setEnabled(), and LLLineEditor::setText(). Referenced by draw(), and navigateHierarchyButtonPressed(). Definition at line 312 of file llfloatereditui.cpp. References LLPanel::childSetText(), LLButton::getLabelUnselected(), LLView::getName(), mLabelLine, LLLineEditor::setEnabled(), LLLineEditor::setText(), and TRUE. Definition at line 266 of file llfloatereditui.cpp. References LLView::getRect(), LLView::getWidgetType(), height, mHeightSpin, mWidthSpin, r, refreshButton(), refreshView(), LLView::sEditingUIView, LLSpinCtrl::set(), WIDGET_TYPE_BUTTON, WIDGET_TYPE_CHECKBOX, WIDGET_TYPE_COLOR_SWATCH, WIDGET_TYPE_COMBO_BOX, WIDGET_TYPE_ICON, WIDGET_TYPE_LINE_EDITOR, WIDGET_TYPE_NAME_LIST, WIDGET_TYPE_RADIO_GROUP, WIDGET_TYPE_SCROLL_LIST, WIDGET_TYPE_SLIDER, WIDGET_TYPE_SPINNER, WIDGET_TYPE_TEXT_BOX, WIDGET_TYPE_TEXT_EDITOR, WIDGET_TYPE_TEXTURE_PICKER, WIDGET_TYPE_VIEW, WIDGET_TYPE_VOLUME_SLIDER, and width. Referenced by handleKey(), and refresh(). Definition at line 305 of file llfloatereditui.cpp. References LLPanel::childSetText(), FALSE, LLView::getName(), mLabelLine, LLStringBase< char >::null, LLLineEditor::setEnabled(), and LLLineEditor::setText(). Definition at line 322 of file llfloatereditui.cpp. Definition at line 67 of file llfloatereditui.h. Referenced by LLFloaterEditUI(), refresh(), and refreshCore(). Definition at line 65 of file llfloatereditui.h. Referenced by LLFloaterEditUI(), refresh(), refreshButton(), and refreshView(). Definition at line 63 of file llfloatereditui.h. Definition at line 66 of file llfloatereditui.h. Definition at line 69 of file llfloatereditui.h. Referenced by handleKey(), LLFloaterEditUI(), navigateHierarchyButtonPressed(), and ~LLFloaterEditUI().